Hello everyone! The latest tool for converting images for use on the TI84+CE/TI83PCE calculators is here! 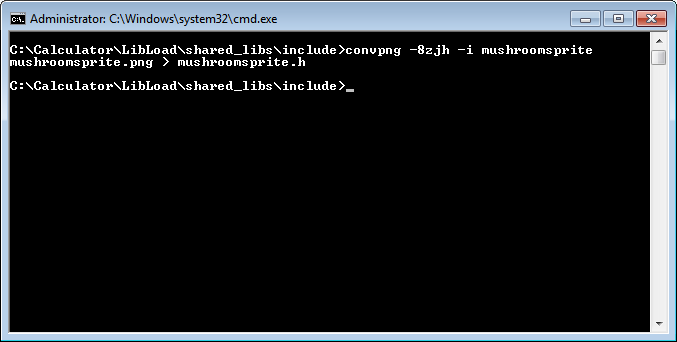 ConvPNG can be used in many ways to output either the assembly or C header file for use in your programs. Many options are available, simply read the provided readme for more information. Enjoy! Update v1.1 is here! It fixes a few bugs with palette conversion, and some output things. Enjoy! What distance metric do you use for palette conversion? How do you handle it then? Do you just assume all the colors are already present in the palette? So the naive/straightforward thing to do is find the palette color p which minimizes √((r_s-r_p)^2+(g_s-g_p)^2+(b_s-b_p)^2) for source color s. But you probably want to read over https://en.wikipedia.org/wiki/Color_quantization to get a good idea of the different options for generating and mapping to palettes. Being honest I personally use the standard mapping approach (nearest colour) in my personal tools. However I typically convert any graphics to whatever palette I'm using in an image editor prior to processing to image data. At some stage down the line other techniques would be useful if this is to become a mainstream utility. You could probably just run k-means on the concatenation of all of the pixels from the images. Let me know if you need any help working with it; or if you have and suggestions/comments. Enjoy! For the technically inclined, it uses a combination of mediancut and K-means in order to choose the best palette for the groups of images. How can I use this to create a sprite using the default palette? I think I could figure out how to embed it in the program, but getting it to the correct format is something I haven't looked into. If possible, could this be done using linux and wine? Have you thought about adding a feature that splits larger pictures into indivisual tiles? Sort of like the PicConvert -t option. Also, I think having an option for making custom fonts would also be helpful. ConvPNG has been updated! Now you can specify custom palettes to quantize against, or use one of the built in xlibc or rgb332 palettes. This means you can specify a palette, and then the image(s) will be converted to match the palette as close as possible. Yup, this can prove useful. tttiler, part of the TI-68k Developer Utilities ( https://github.com/debrouxl/gcc4ti/blob/next/trunk/tigcc/tools/tttiler.c ) , provides such tiling functionality, for monochrome and 4 grayscale images. The problem (And I imagine this has something to do with your post in the SDK topic) is that you updated ConvPNG for the toolchain. You don't want to do this ConvPNG will be added to the toolchain once it is confirmed to work properly with the new graphics library setup (later this week); as for now this update was just to resolve some assembly creation issues. © Copyright 2000-2019 Cemetech & Christopher Mitchell :: Page Execution Time: 0.214321 seconds.